The second year of the American Arts Commemorative Series featured a one ounce gold medallion honoring American author and humorist Mark Twain. Born Samuel Langhorne Clemens, he was the author of such celebrated novels as The Adventures of Tom Sawyer and The Adventures of Huckleberry Finn. The obverse design of the medallion features a front-facing portrait of Mark Twain with his bushy white hair and mustache, dressed in his characteristic white suit. The reverse design features the image of a steamboat on the Mississippi River, recalling Twain’s personal experience as a riverboat pilot, which he would draw from to write some of his stories. A small raft can be seen in the foreground, perhaps representing Huckleberry Finn and his companion Jim. 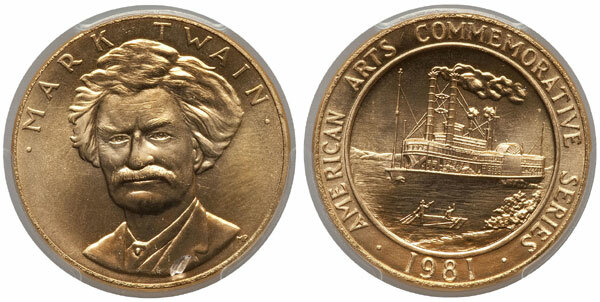 The obverse carries the inscription “Mark Twain”, while the reverse is inscribed “American Arts Commemorative Series” with the date “1981”. The medallions were once again struck at the West Point Bullion Depository, but this year with a slightly altered composition of 90% gold, 7% copper, and 3% silver. The inclusion of silver was intended to improve the appearance of the metals. In addition to the composition change, this year the medals were packaged in gift boxes and included an insert with biographical information about the subject of the medal. After the initial interest in the series faded, production levels were phased back and the mintage for the Mark Twain American Arts Gold Medallion would reach only 141,000 pieces, of which 116,371 pieces were sold. This issue remains one of the more available of the series and can typically be acquired for only a slight premium to the precious metal value.